My family grew up on cinnamon knots from Granite Bakery, they were one of our favorite things. My mom would always buy them when she’d stop in there for bread and she’d usually buy several dozen to take on our annual camping trip to Snow Canyon State Park over Easter. I don’t live right by Granite Bakery anymore, but occasionally I’ll stop in and buy a few, but they’ve gotten a little pricey. Thankfully now I can have them anytime because these Morning Buns taste just like the them. Seriously, they are spot-on and possibly even be better. I’ve had this recipe bookmarked forever and I’m really, really wishing I would have made these sooner. 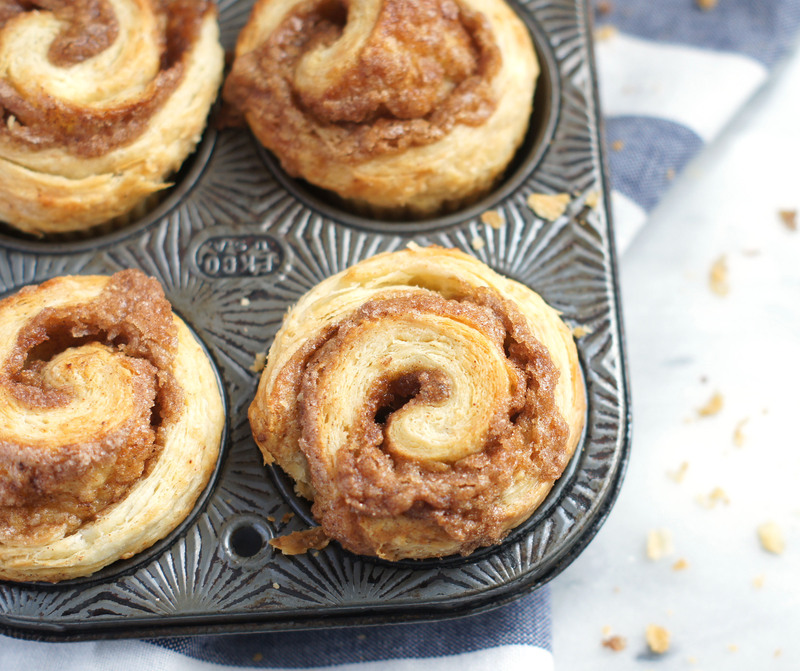 These Morning Buns are one of the most scrumptious pastries ever. 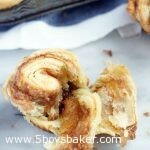 They are a cross between a cinnamon roll and a croissant which makes them extremely irresistible. I could eat these every single morning and never get tired of them. These are actually simple to make, but do require a minimum chill time of 4 hours so plan accordingly. Make sure you spray your liners, I know that may seem strange, but these become gooey and sticky on the bottom while baking and will stick to the liners if you don’t spray them. Also, make sure you remove the liners when the directions tell you to. They are hot, so be careful doing it, but if you wait too long, the liners are a bit tricky to peel off and trust me, I’m speaking from experience. 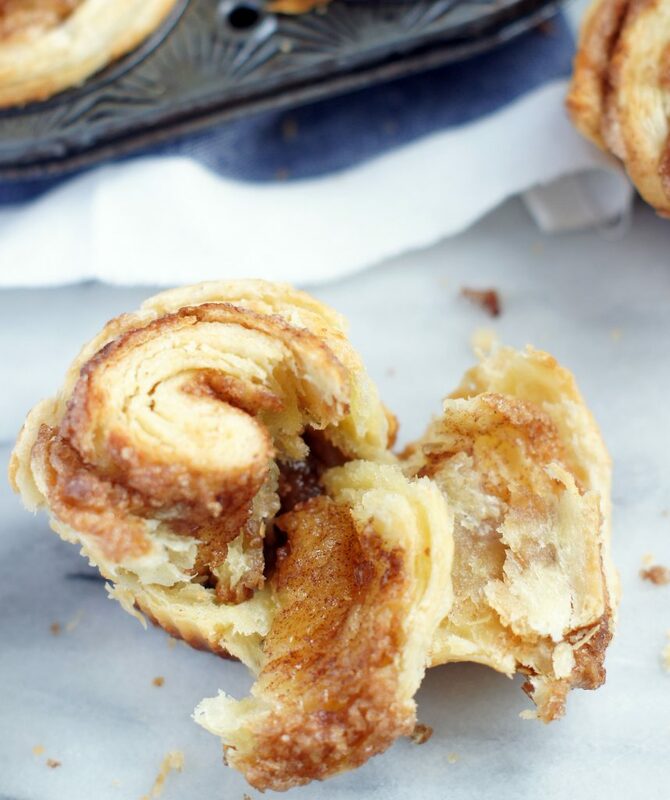 Buttery, flaky, cinnamony, what’s not to love. These are amazing warm and just as good at room temp. I dare you to try and eat just one. Buttery, flaky, cinnamony and utterly scrumptious. You will fall in love with these Morning Buns. To make the dough, combine the flour, sugar, yeast and salt in a large zipper-lock bag. Add the butter, seal and shake to evenly coat the butter. Press the air out of the bag and reseal. Roll over the bag several times with a rolling pin, shaking the bag after each roll, until the butter is pressed into large flakes. Transfer the mixture to a large bowl and stir in the sour cream, orange juice, water and egg yolk until combined. Turn the dough onto a floured surface and knead briefly to form a smooth, cohesive ball. Roll the dough into a 20x12-inch rectangle. Starting at the short end, roll the dough into a tight cylinder. Pat the cylinder flat into a 12x4-inch rectangle and transfer to a parchment paper-lined rimmed baking sheet. Cover with plastic wrap and freeze for 15 minutes. Line a 12-cup muffin tin with liners and grease with non-stick cooking spray. To prepare the filling, in a medium bowl, stir together the sugars, cinnamon and vanilla. Remove the dough from the freezer and place on a lightly floured surface. Roll the dough into a 20x12-inch rectangle and sprinkle evenly with the filling, leaving ½-inch border around the edges. Lightly press the filling into the dough. Starting at the long end, roll the dough into a tight cylinder and pinch lightly to seal the seam. Trim ½-inch of dough from each end and discard. Cut the cylinder into 12 equal pieces and transfer cut-side-up to the prepared muffin tin. Cover loosely with plastic wrap and refrigerate for at least 4 hours or up to 24 hours. Put a loaf pan onto lower rack of oven and fill with boiling water. Remove buns from refrigerator and discard plastic. Place buns in oven until puffed and doubled in size, about 20 to 30 minutes. Remove buns & water pan from oven and heat oven to 425 degrees. Bake until buns begin to rise, about 5 minutes, then reduce oven temperature to 325 degrees. Bake until deep golden brown, 40 to 50 minutes. Cool buns in tins for 5 minutes, then transfer to wire rack and discard liners. Serve warm. A cross-cinnamon roll?! DROOL! These look incredible. Bravo! Thanks Karly! They are insanely delicious!